August 28, 2018 — Comments are off for this post. 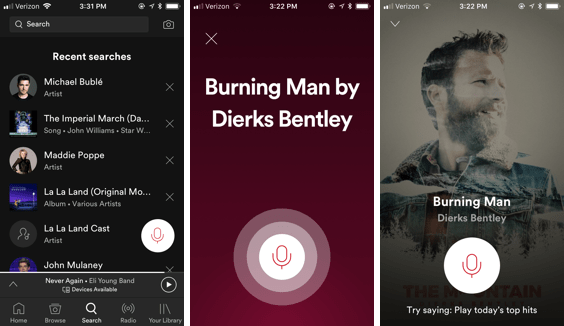 Spotify has added a small floating action button to the top right of their screen, that takes you to an in-app voice search. Two points: Dierks Bentley is amazing. (“Burning Man” is a fantastic song/meditation on the human experience.) Two, the effect of this feature was to make search nearly frictionless: it took less than a few seconds to find the song. Gary Vaynerchuk, in a recent interview with Paul Cutsinger from Alexa, said “voice will rise to be the dominant user interface because it is simply faster.” This strikes me as exaggerating to make the point–voice is faster, at least as an input. Spotify, long native to Alexa, now has its own voice assistant, and I suspect this will provide it a competitive advantage. The experience of searching for a song was delightful, if only because it was frictionless.